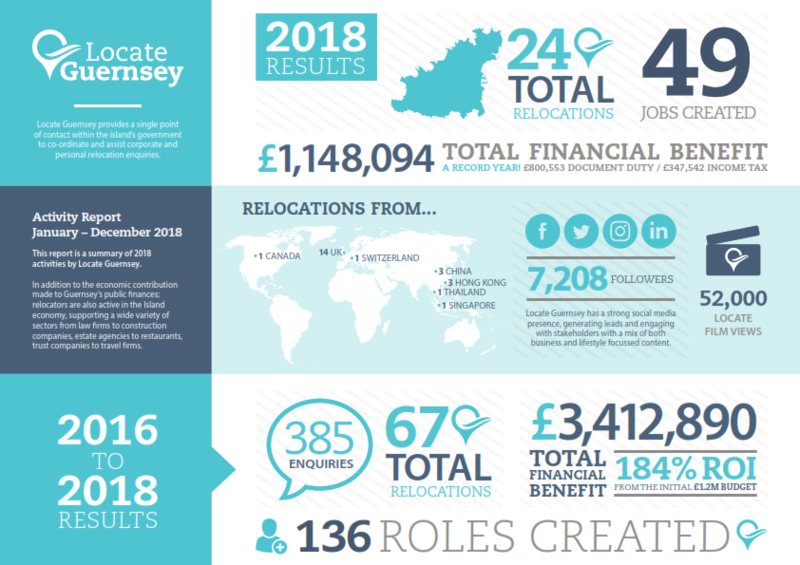 Locate Guernsey, the States of Guernsey agency responsible for advising and supporting personal and business relocations, has reported another prosperous year for relocations to Guernsey. Figures released today show a record £1.148M of benefit was returned to the exchequer from 24 relocations in 2018. Just over £800,000 of income was provided by document duty from property purchases with a further £347,000 generated by the 49 new roles relocaters created. 2018 marked the end of the initial three year budget period for Locate Guernsey. The combined results for 2016-18 show that an estimated £3.412M of total financial benefit for the States of Guernsey was generated from 67 relocations. The figure represents a 184% ROI based on the agency’s £1.2M original budget.